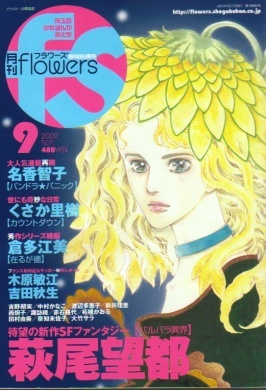 "Barbara", Hagio Moto's new series, started in the Flowers September issue. Aoba is a girl living in an island called "Barbara". She is being raised by Ma-chan. Ma-chan says Aoba is a child of the Moon princess and the Sea Prince. Daiya is Ma-chan's younger siter. She has two sons, Taka and Pine. They can fly in the air. Aoba can't fly even though Taka and Pine show her how to fly. 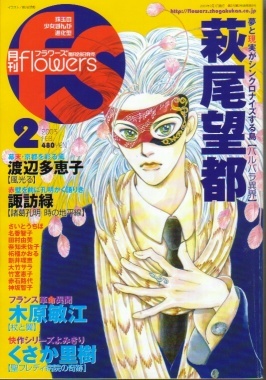 Senri is a 21-year-old man living with his grandfather. His mother died to protect him twenty years ago. He remembers that because he can see the past and the future in the dream. Aoba thinks she saw a big goldfish in her dream. Taka had the same dream, but he doubts it was a goldfish. The folollowing installments are not compiled yet.